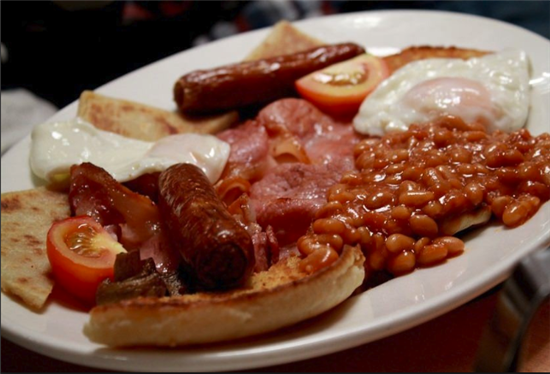 The best known traditional dish in Northern Ireland is the Ulster Fry. An Ulster fry, although not originally particularly associated with breakfast time, has in recent decades been marketed as Northern Ireland's version of a cooked breakfast. It is distinguishable from a full breakfast by its griddle breads – soda bread and potato bread, fried (or occasionally grilled) until crisp and golden. Sometimes also including small pancakes. Bacon, sausages, an egg, and (as a modern development) tomato and sometimes mushrooms complete the dish It is usually served with tea and toast. Soda Bread is one of Northern Ireland’s griddle breads, it can be eaten straightaway, or cooked until golden in an Ulster Fry. They are sometimes eaten with butter and homemade jam, or with savoury food such as smoked salmon, fresh fried eel, or thick dry-cured bacon. Soda Bread is a soft, thick and fluffy bread. It was first baked in the 1800s in Ireland, and local people used baking soda to cause the dough to rise. It's typically served with an Ulster Fry. Potato Bread a flat bread prepared with potato, flour, and buttermilk.It is cooked on a griddle. It all looks great except for the beans, can't do beans in the morning...just me.